Early last week, when I wrote about Sallie Mae’s latest interest rate adjustment for its high-yield savings account, I mentioned that I was thinking of getting one for myself because the new yield, 1.30% APY, is higher than what I get from my accounts with Ally Bank (1.20% APY) and EverBank (1.26% APY). Actually, I have been considering a new savings account for quite some time, with potential banks such as Discover Bank and American Express. However, they both lowered their rates in the past few months to the levels that are almost identical to what I already have, so the plan was never put into action. Instead, during the same period of time, I actually closed a few accounts that I no longer wanted to keep: Capital One and HSBC Direct (now HSBC Advance). With the trend of interest rates at online banks seems to be reversing (so far at least three banks have increased their rates), I feel that it may be time to get a new account. And with Sallie Mae High-Yield Savings Account being the most competitive choice, rate wise, I finally made the move over the weekend. The account opening process is rather straightforward, taking only about 10 minute from start to finish (see How to Open Sallie Mae Savings Account for details). In fact, from my experience, the process of opening an online savings account is pretty standard nowadays: Select the account type, provide personal information, verify identity, choose account funding method, and create online account access. 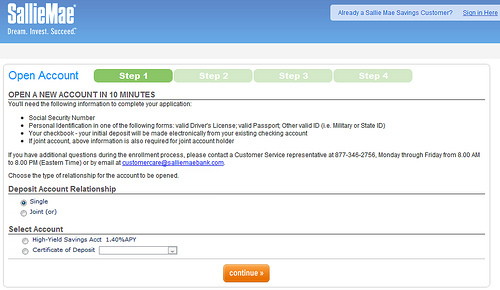 For SallieMae account, there’s no paperwork to be sent back to the bank. All were done online. During the process, I was asked to provide external bank information to make initial deposit (though no minimum deposit is required for this account) and I linked Sallie Mae to my Bank of America checking account. The trial deposits, which Sallie Mae uses to confirm the ownership of the linked checking account, haven’t shown up in my BofA account yet. Once it’s confirm, I plan to move most of my money to Sallie Mae for the better rate, though I don’t have that much of cash in my accounts now as I did a month ago. In the bankrate site , I got the idea that capital one and AMEX getting better ranks from Sallie Mae as banks, and their interest rates are good enough too. I would appreciate for your opinion.